The DESIS Lab (Design for Social Innovation and Sustainability) at Parsons The New School for Design and the non-profit Public Policy Lab were awarded a 2012 New York City Cultural Innovation Fund grant from the Rockefeller Foundation for Public and Collaborative, an innovative new partnership with the New York City Department of Housing Preservation and Development (HPD). The project explores ways to facilitate the involvement of community residents in the development of housing-related services in neighborhoods with significant public and private sector investment leveraged by HPD. The research effort, which began this past spring, is led by a team of Public Policy Lab Fellows, Parsons faculty, and Parsons students who will target specific neighborhoods where HPD programs and initiatives are most active. The program kicked off with a series of lectures at Parsons highlighting cross-sector collaboration, the nexus of design and public policy and the delivery of critical government services. 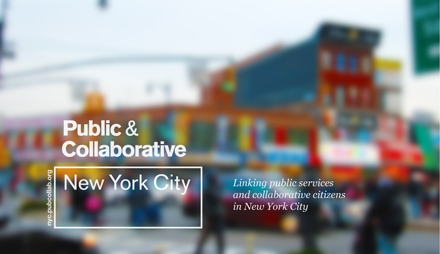 For more information on Public & Collaborative, including videos of the spring lecture series, please visit http://nyc.pubcollab.org.